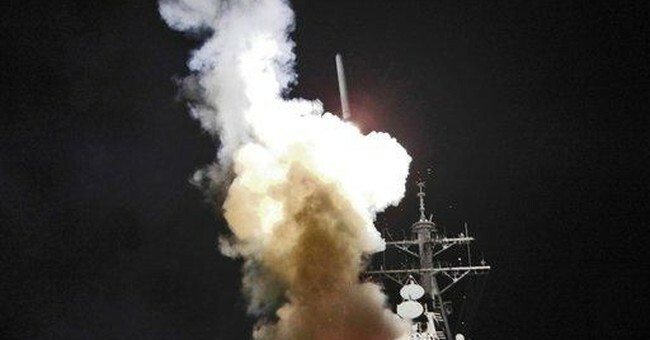 UPDATE: NBC News reports around 60 Tomahawk missiles (NBC Pentagon Correspondent Hans Nichols revised the numbers) have been fired from the Eastern Mediterranean against the Syrian airfield where the chemical attack was reportedly launched. The U.S. military fired at least 50 Tomahawk missiles intended for a single target — Ash Sha'irat in Homs province in western Syria, the officials said. That's the airfierld from which the United States believes the government of Syrian President Bashar al-Assad fired the banned weapons. Katie wrote about President Trump’s remarks from Mar-a-Lago, where he issued a call to arms to the civilized world to end the carnage in Syria. According to various networks, we could see American military action in Syria within the next couple of hours. It will be in retaliation to the horrific chemical weapons attack on Khan Shaykhun in the Idlib Province of Syria. President Trump called the attacks, which killed at least 80 people, an “affront to humanity." The action prompted Secretary of State Rex Tillerson to declare that current President Bashar al-Assad, who has been accused of executing this attack, is not fit to govern. US military officials tell @NBCNews @ckubeNBC they're confident Assad regime responsible for chemical attack. President Trump is weighing options for a military strike in Syria, a possible prelude to a major expansion of American intervention that officials said Thursday could serve as a response to a devastating chemical weapons attack by the Syrian government. As Defense Secretary Jim Mattis prepared to meet with Mr. Trump in Florida to discuss military options, Secretary of State Rex W. Tillerson promised a “serious response” from the United States to the use of chemical weapons on Tuesday by the government of President Bashar al-Assad. Mr. Tillerson made it clear that the Trump administration saw “no role” for Mr. Assad to continue governing Syria. American officials said the options ranged from a limited cruise-missile strike to destroy a relatively isolated military installation to a multiday offensive that could involve the use of American warplanes against a range of targets, including Syria’s extensive air defenses. Justin wrote that Trump could decide to launch cruise missiles from naval ships in the region. Russia has softened their support of the Assad government as well. Both BBC and NBC News’ Richard Engel said that this attack could happen within hours. Engel added that U.S. military officials are confident that Assad was behind this attack. He also said that the president is looking to a smaller scale operation, it will not be a large massive military action. Engel added that it could be one focused on strategic strikes—most likely focusing on degrading the nation’s chemical weapons capacity. Engel added that regime change is not on the table nor is there a plan for a significant ground invasion.